Okay, now....get out there and support your local art scene! STUNNING! = Looks like something out of First Grade! I HAD TO TAKE A SECOND LOOK! = No one can be that bad on purpose! You're hip to this. I was hoping for additional entries. I like the painting hangining on the wall -- is there something wrong with me? In this little cartoon, I wanted to create a bit of lousy art to set up the "translations". Dang if I didn't enjoy putting the shapes and squiggles ANTWHERE I WANTED with absolutely no regard for rhyme or reason. But that is the illusion. I did that little fart of a visual with SOME KIND OF DECISION_MAKING PROCESS. So in the end, I cannot escape the "rhyme and reason" of making marks just because I fail to acknowledge where they came from. Weird, huh? NOW THAT'S ART. = (Is that art?). J's "color choices" and G's "second look" cracked me up. 3 rubber chickens for the both of ya. You know, there WAS someone who got their little kid to paint abstract art masterpieces and took the art world by storm until the secret got out. Then the art world was falling all over themselves with competing theories about how it was either horrible that they got scammed, or that the work was marvelous regardless of how it came into being. IT'S A NEW COMMISSION - the gallery got taken to the cleaners buying that piece of crap. IT APPEARS TO HAVE INSPIRATION FROM - it also looks like my baby son threw up his orange juice again. C'mon folks - Cox is settin' y'all up. 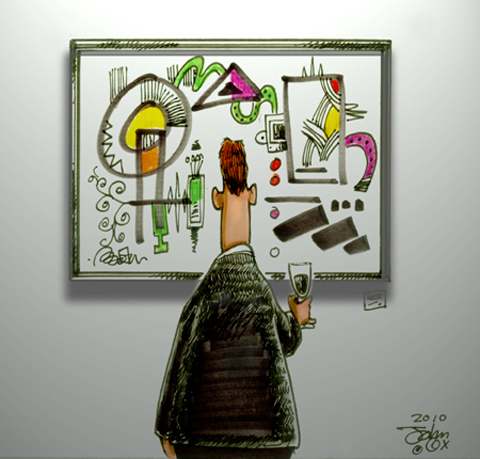 Any serious art connoisseur can tell you that the painting is, in fact, an original Rube Goldberg! John, you may think that's lousy art, but there's a female "artiste" in this town who couldn't do that well on her best day. She's from old money, & she entertains her delusions with a gallery filled mostly with her "work". The only time people (who aren't from her social circle) go there are when she has special exhibitions featuring the work of other artists in her "ell" wing. NOW I KNOW WHY THEY'RE ONLY SERVING WARM VELVEETA ON SALTINES & RIPPLE. I WONDER HOW THEY GOT THE CRUST ON THE VELVEETA. WHERE'S WALDO? HOW WOULD I KNOW IF FOUND HIM? UH, YOU GUYS BETTER BE CAREFUL. THIS GUY DID A TOUR IN 'NAM. HE TITLES EVERYTHING HE DOES "STRAFING". LET'S SAY THAT OBAMA DID IT & SEE IF HE WINS A NOBEL PRIZE IN ART. THEN LET'S SAY GEORGE W. BUSH DID IT & SEE IF THEY BLAME EVERYTHING ON IT. What do you get if you cross a painter with a boxer? This page contains a single entry from the blog posted on June 11, 2010 8:58 AM.